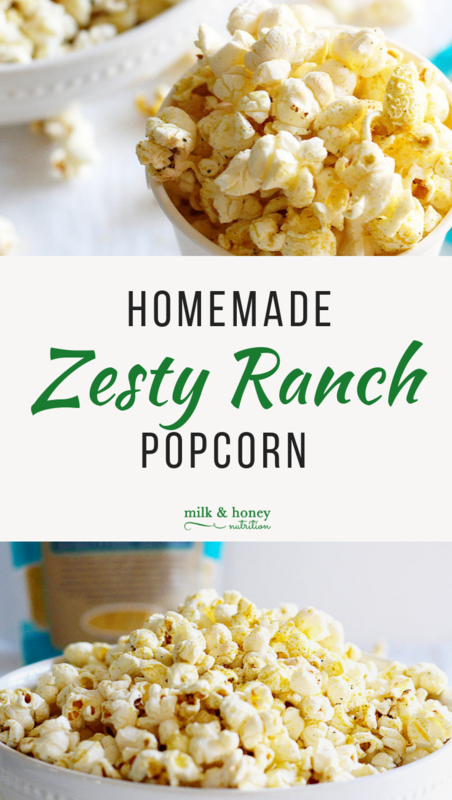 Kick up movie night a notch with this Homemade Zesty Ranch Popcorn Perfect for Movie Night! It’s got that perfect zesty flavor and great for kids and adults alike. Nutritional Yeast gives it a deeper almost cheesy-like flavor. This recipe for Homemade Zesty Ranch Popcorn Perfect for Movie Night was sponsored by Bob's Red Mill. All ideas and thoughts are my own. Heat the avocado oil over medium high heat until melted in a large pot on the stove. Add 3-4 popcorn kernels to the pot and cover with the lid. As soon as one of the kernels has popped, add the rest of the kernels. Slightly tilt the lid to vent the steam and shake occasionally until all the kernels have popped. While the popcorn is popping, mix the seasonings together in a small bowl. When the popcorn is done, immediately pour the seasoning mix into the pot and toss to combine. Enjoy immediately, or store in an airtight container for up to 2 days for optimal freshness!